Editorial Comment: Some of ya need remindin’ – the Order of Leviathan is meant to be a position of honor, and one which you all richly deserve. But it doesn’t come with the title of pirate lord, pirate king, or pirate demi-god, so please stop bandying such terms about, lest ya discover that yer not too big for a swift kick in the seat! 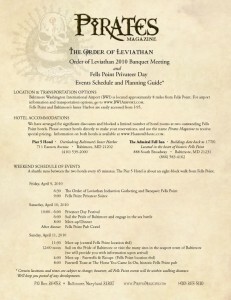 Last I checked, the official Fells Point Privateer Day website was still from 2009, but Pirates Magazine has their own info up to date. And don’t let the name fool ya, either – this is a pirate weekend (not a mere privateer “day”.) Oh, and before any of you non-Leviathan sorts need to ask, yes, these events are open to ALL of us. 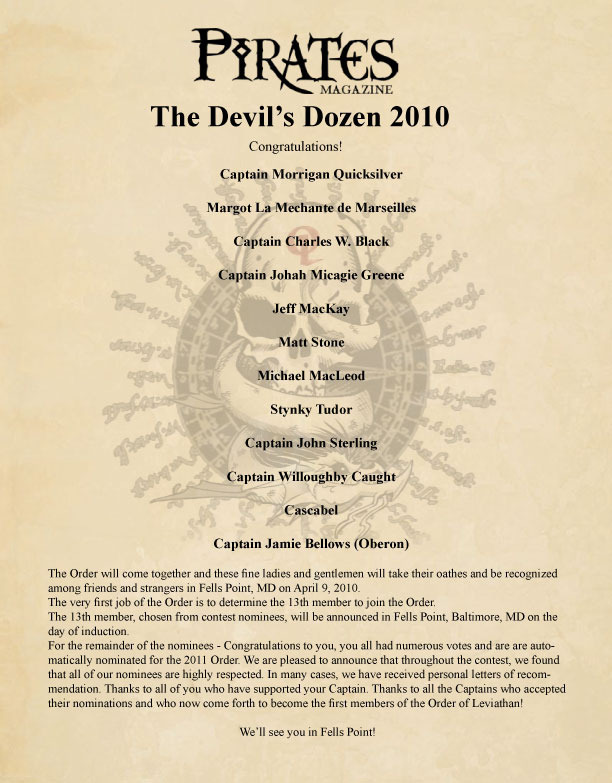 Some are free, and some (Privateer Soiree, cruises) will have admission fees, but I don’t believe any are exclusive to the Devil’s Dozen winners. Keep checking the linked websites for details, and I hope to see many of you there! 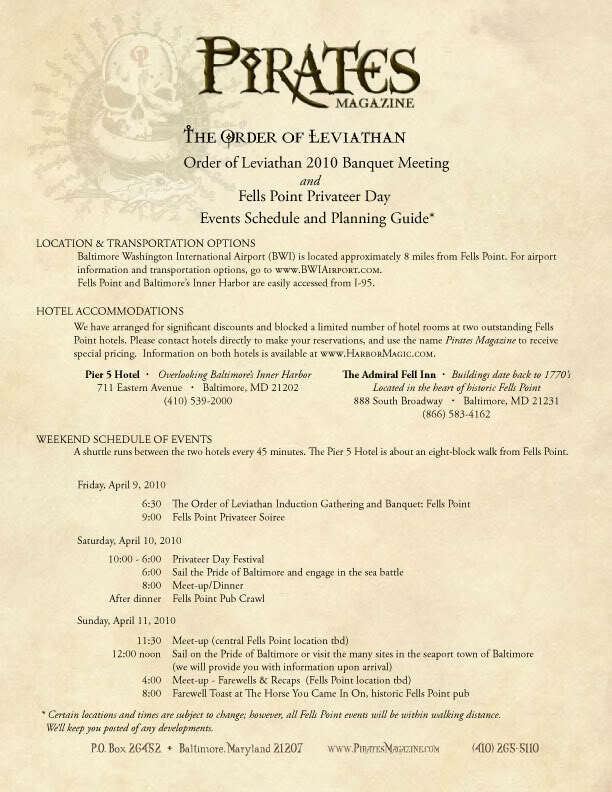 This entry was posted in News and tagged fells point, order of leviathan, pirates magazine by Bilgemunky. Bookmark the permalink. Overall I’m fairly pleased with the winners. All of them seem to be filthy wretched lowlives – er – I mean, standup gents. Aye, there’s definitely some real worthies that didn’t make the vote, and Spoo was a surprise. That said, I can’t fault the winners for that – those that I know well deserve it, and from what I’ve read, those winners that I don’t know also deserve it. Mates Spoo is worthy indeed but unfortionatly he was at sea and got a late start in promoting himself in the contest. I hope he comes to Fell’s Point and Privateer dayt weekend featuring the Order of Leviathan and THE dEVIL’ dOZEN ,Their is one more RING! Congratulations to all those whom made the cut that will surround that table in the tavern with thar silver rings and rum! Eye will enter next year now that this ship has sailed. Ohhh me mate Oderlesseye. Ye be a fine addition to next years contest fer sure.Ye will give them other a run fer thar money indeed! 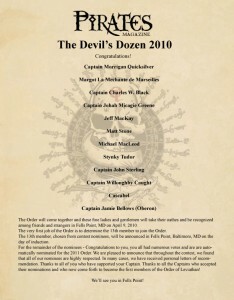 Yes there is anothers Devil’s Dozen for 2011. I hope Synn makes it to this years event. Thar is one more ring! Say, any ideas on when nominations for next year begin? Well thank ye Bilge…look forward to seeing you again. I’d vote for you Oder if I wasn’t intending to apply myself as well. Every contest needs someone that no one will vote for, like Nader or Perot. this post has been stuck at the top of your blog (or at least it has for me) for the past month now, unless you sticky’d it. I can’t wait for this event to finally happen so it will stop being the headline on this site!